Hi, guys! Today I'm sharing a much anticipated makeup tutorial with you all! It seems these freezing cold winter months have really put my skin in a dull state. 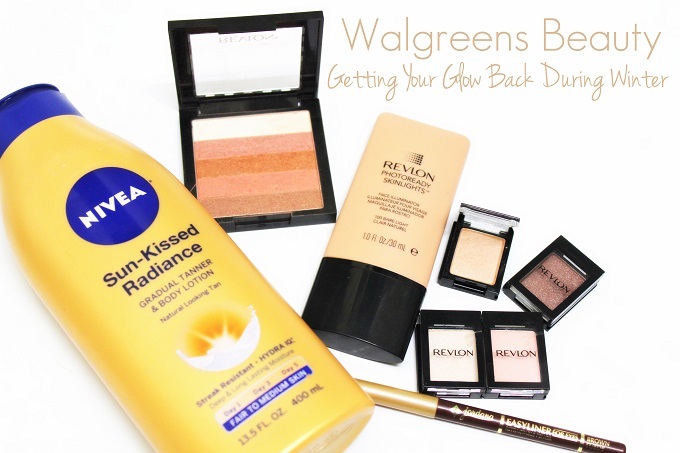 I was shopping around Walgreens a couple weeks ago for some "pick-me-up" products (AKA my excuse for buying more makeup) and stumbled across some awesome new products to revive my skin and give it a fresh glow....and I'm not talking about the "snow white glow", either! A few of you may have already seen me RAVE about this amazing gradual tanner I found in Walgreen's beauty section. It has literally became my holy grail lotion and self tanner. Imagine, a gradual tanner that doesn't smell bad, streak, and dries quickly - this one does all of those things! I own the "Fair to Medium" bottle but I actually went back and got the "Medium to Tan" bottle and started mixing them, the color is flawless and I can't believe I'm actually wearing my summer color foundations, in the winter! Oh yes, you guessed it, these adorable little Revlon shadows click together to make a custom palette! I was so glad when I saw these at my local Walgreens, and of course, couldn't resist making my own warm/neutral palette to brighten up my eyes! I love the pearlescent sheen these shades give my eyes. I picked up "Oyster", "Sand", "Java", and "Blush". I found an awesome new product Revlon has recently put out called "Skin Lights". These liquid illuminators are perfect to mix into your foundation for an all over natural radiance! I got the "Bare Light" which is a gorgeous champagne color that would be universal for all skin tones! I like to mix a small dot into my foundation for a natural radiance. Don't worry if if you have oily skin, this product does not make you look shiny or oily! Also, if you're looking for more of a bronzey, pink, or even peachy glow...Revlon has got you covered too! the "Skin Lights" come in four different shades! How I Get My "Glow"
Enjoy this quick tutorial on how I use these fresh and glowing products! Love it!!!! Your look is amazing and I love all these new products I'm going to have to check out! I'm a total makeup junkie :) Pinning your tutorial--it was great!